A storyboard is a map that guides eLearning professionals through every twist and turn of their eLearning course design. eLearning storyboards make the eLearning design and development process much more efficient, as they can not only help eLearning professionals to illustrate their ideas, but also to deliver engaging and visually rich eLearning experiences to their audience. In this article, I’ll share 12 tips that will help you create eLearning storyboards, so that you can effectively develop and communicate your eLearning vision. Every successful online course has one thing in common: a solid foundation. If you don’t have a stable structure in place when you begin creating your eLearning deliverables, every aspect of your eLearning course will suffer as a result. This is why an effective storyboard is such a vital tool for eLearning professionals. The first storyboard in history was developed at the Walt Disney studios during the early 1930s, when animator Webb Smith came up with an alternative to describing a cartoon plot with words: He drew sequential scenes on separate sheets of paper and pinned them up to the walls of his office. eLearning storyboards ensure that you and the reader are literally on the same page, as it is a document that describes every single piece of your eLearning course, specifying its visual, text, audio, and interactive elements. You can use a storyboard to help the subject matter expert fill in their expert content, or to help your developer to use it as a blueprint for the final product in order to sequence the eLearning course according to your instructional design. In this article, I'll share 12 tips to successfully create an eLearning storyboard, so that you can make your clients or supervisor(s) visualize the eLearning experience you have in mind. There are many free storyboard templates out there, so the only thing you need to do is decide whether you want to use Word, PowerPoint, or a commercial application. Have a clear idea of your goals and objectives beforehand. Why are you creating this eLearning course? What are your main and secondary learning goals and objectives? What are the desired results? The answers will guide the whole storyboarding process. It’s essential to have a clear idea of what you want to achieve by creating the eLearning course. Identify exactly what the learner needs to take away from their eLearning experience and why they need to acquire the information in the first place. Meet with subject matter experts to find out what needs to be covered and what can be left out, so that you can determine how much data you are working with in advance. Research is key to creating a successful eLearning storyboard. Conduct focus groups, surveys, and one-on-one interviews to learn as much as possible about your audience, including their educational background, culture, professional knowledge base, experience level, and what skill sets or knowledge you need to include in your eLearning course. Also, assess previous strategies that the client has used to identify what worked and what did not, so that you can develop a more effective eLearning storyboard. Figure out when and how you will assess your learning audience. While many people might assume that adding eLearning assessments is one of the final stages in the planning process, it should actually be one of the first. While you are creating your storyboard figure out where each of the tests and exams will be placed and what type of assessment is best suited for the subject matter and audience. Look at the storyboard, as a whole, and map out your knowledge checks, as well as lesson summaries and chapter recaps. In addition, include basic information about the eLearning activities and online exercises, such as the key points it must include, which learning goals they tie into, as well as how each will be graded. Write content for each of your eLearning objectives. Writing content for each of your objectives will help you keep your eLearning storyboard flow natural and your audience focused. State your topic, explain your idea, focus on key points, and maintain a conversational tone by using simple language, short sentences, examples, or metaphors, and asking questions. Furthermore, consider letting your audience think about the situations you present them and select the answers from a variety of options before moving on to your next topic. Organize your material by creating your content sequence. 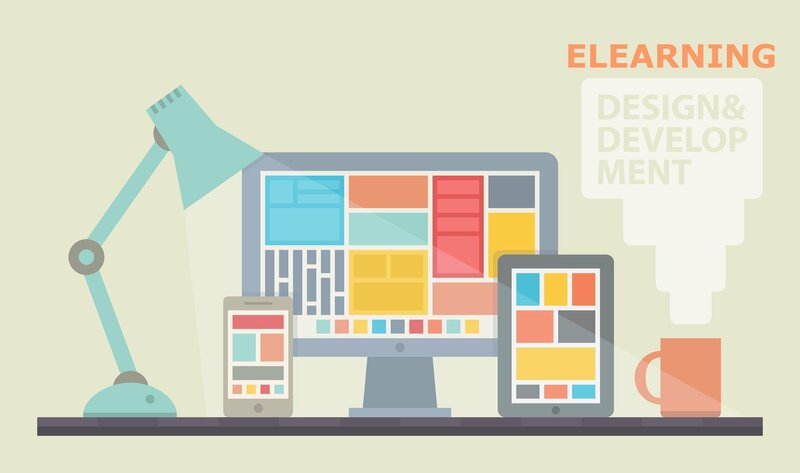 To support your eLearning objectives, you need to define the right design elements. Gather the learning material from the subject matter expert and all information necessary from your client to organize your content. Break your content up into chunks and modules to effectively depict it in your storyboard. Then, decide about the sequence your eLearning content is going to be presented to your audience. The more natural is the order flow of your content, the more effective your eLearning course will be. Think of what topics or units should come before or after others and arrange accordingly. A good tip is to title every page of your storyboard. Although titles will not appear on the final product, they will help you organize your content more easily. Decide upon the multimedia elements. Images and graphics, animations, eLearning videos, all these and a lot more help your audience capture best the message you need to get across. Decide upon all the multimedia elements you will incorporate into your eLearning course by including an analytical description of each in the corresponding part of your eLearning storyboard. Be sure to leave room on each screen for visual and audio elements, such as clips, narrations, and interactive scenarios. It's a good practice to note their position on the page by drawing a rough sketch or by adding a text description. Be as detailed as possible when storyboarding interactions. As your progress through each screen of your storyboard include every interaction that needs to be integrated into the final design. For example, if you need to redirect your learner to the first screen of the second module when they click on a button, mention that in your storyboard. Do this for every activity, assessment, and navigation icon in your eLearning course so that you don’t run the risk of broken hyperlinks or a disorganized navigational flow. After selecting all media types you will use, start writing the corresponding narrative scripts. Keep screen text short and to the point, as it's going to be further explained in your voice overs. You have only one chance to deliver your points, so remember that too many words on each screen may tire or even bore your audience. Include the script for any narrations and the individual branches for your scenarios and simulations into your storyboard for every screen of your eLearning course. Bear in mind that the storyboard is going to serve as a guide as you move forward in the development process. So, now it's time to take your final decision about how much content you are going to include on each page and how you are going to deliver the information. If you have a lesson that may be lengthy or contain an abundance of text, then break it down into more digestible modules and only include the key takeaways. By taking cognitive overload into consideration at this stage you can create an eLearning course that is concise and cohesive instead of having to make major modifications during the final revision process. Don't forget to revise your script accordingly. Map out the eLearning course navigation. Decide where to put the next and back buttons, what graphics you will use to denote these actions, and how your eLearning course will respond to specific behaviors of your audience. For example, you can outline what will happen if a learner provides an incorrect response or clicks on a link that redirects them to a third-party site. Creating an outline for all of these branches will make the design process much easier, as you will already have a clear idea of which navigational elements belong on each page. Include transitions between each lesson. Storyboarding gives you the opportunity to plan out every detail of your eLearning course, including how and when you will transition between slides and modules. Include transition screens between topics and make a note of how you will transition to the next segment. Also, don’t forget to include a brief summary of what they learned in the current lesson, as well as what they can expect to learn in the next to pique their interest. Additionally, you can allocate time for reflection at this point, so that your learners have the opportunity to review what they have learned and tie it to real world applications. This not only brings value to the eLearning course, but also boosts knowledge retention by enabling your learners to commit the information to long-term memory. Keep these tips in mind to create effective eLearning storyboards. It may be true that no two eLearning courses are alike, but every eLearning experience should begin with a successful storyboard. Now that you know how to create an eLearning storyboard, you may be interested in taking your eLearning presentations to the next level. Read the article Top 10 Tips To Create Effective eLearning Presentations and Slideshows and learn how you can produce amazing, interactive, and highly engaging presentations and slideshows for your learners.